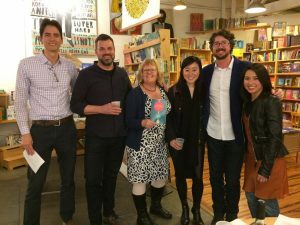 Just pickled pink to read with Grant Faulkner, Stace Budzko, R. O. Kwon, Britt Haraway, and Dan Moreau to celebrate the 2016 Best Fast Fiction anthology, at Flash Fiction Collective, hosted on Feb. 2nd by Kirsten Chen. Flash Fiction Collective puts on a great show, great writers and a nice vibe — check them out next time. They host events about every two months at Adobe Books on 24th Street in the Mission in San Francisco. So pleased to read with these brilliant writers!